Format: a standard 330mL brown bottle, a pretty ordinary macro label. Appearance: a clear amber-orange in colour with medium carbonation across the profile. A fairly thin white head dissipates fairly quickly. Aroma: plenty of tropical and grapefruit hops with a touch of sweet malts. Decent. Taste: quite easy-drinking with the tropical and sweet malts, but quite subdued. Not bad, but not amazing. Aftertaste: drops away fairly quickly, which is fair enough since it's such a sessional beer. Mouth feel: light in body with a spritzy carbonation that carries the flavour quite well. Overall: a reasonable summer ale that while not overwhelming, is a good thirst quencher. A bit higher in ABV than your normal summer ale as well, which would normally be around 3.5%. AU$57 a case of 24 x 330mL bottles, which is reasonable. Probably better out there for the same price, but hey. Worth a 6-er. This and a bottle of Little Dove were kindly donated to me by the Gage Roads rep for the purpose of reviewing it - thanks! I’ll give it a good home (in my belly). 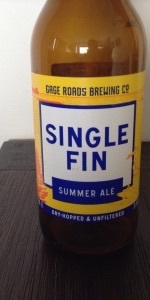 So I did caution the Gage Roads rep: I’m not a fan of Summer Ales, Session Ales, or in general anything south of 5% ABV, that said I don’t mind the occasional Gose or Gueuze and they’re generally south of 5% - those are the exceptions that prove my rule though. He said to give it a shot anyway, OK free beer - I’ll bite [even though I got stung before when a Matilda Bay rep gave me a free sample of Minimum Chips which tasted so much like soda water that it felt almost healthy drinking it - yuck!]. Well here goes Single Fin - if you taste even remotely healthy I will be disappointed. Poured from a 330ml bottle into a nonic pint. A: First test passed: It looks like beer and not soda water. Hazed tan-tinged amber body with a splotchy blanket of white on top... head could be a little bit better at 4.5% ABV, but oh well, looks OK otherwise. 6/10. S: A balanced malt/hop affair with caramel notes, slight stone fruit character and... oh I get it - this is another Stone & Wood Pacific Ale knock off (others include: Fortitude Drifter, GB 3 Bolt, Balter XPA, Burleigh Twisted Palm... this list goes on...). Well the question will invariably be: How does it compare to S&W PA? This reiteration is a little bit more malty than the original product. 7/10. T: Flavour was a bit subdued, but it is officially winter in Brisbane and I actually had to wait for it to warm up a little (I know - crazy!). It leans more towards the caramel malt than anything, some stone fruit/tropical hop notes linger in the background struggling to match the malt base. Finish has a touch of bitterness with a surprising dry character (this isn’t a Lager so dryness is a surprise here). It’s meh here... not terrible, but meh. 6/10. M: Best part of this brew is the mouthfeel - it’s fairly creamy, mid to light bodied, has a bit of heft for a 4.5% ABV beer, it’s alright. 8/10. D: As expected a bit too flavourless for my liking... and it’s another S&W PA knock off - look I get that S&W PA is killing it in the market, but if you’re going to go up against them you at least need a product as good as them. My respect for S&W Pacific Ale grows more and more every time another brewer tries to emulate their tasty brew and fail. Overall I wouldn’t knock this back on a hot day, but that’s not enough of a reason to give Summer Fin a free pass. 6/10. Food match: Pizza I guess... or a hamburger... something. From bottle, Pours Hazy golden, half finger head. Aroma citrus and pine. Light body, good carbonation. Taste citrus over very light malty sweetness and develops the bare set hint of bitterness in finish. Nice ok.